Congenital facial paralysis is classified as traumatic or developmental, unilateral or bilateral, and complete or incomplete (paresis). Determining the etiology is important because the prognosis and treatment differ, depending on the underlying pathophysiology. An appropriate history and physical examination usually resolve the origin, but radiographic imaging and neuromuscular testing may be necessary for treatment planning. An extended physical examination is needed to exclude other congenital malformations. Associated anomalies may include microtia, inner ear abnormalities, extraocular muscle paralysis, facial hypoplasia, other cranial nerve deficiencies, cleft palate, internal organ disorders, and extremity deformities. A child with Möbius syndrome is depicted below. Child with Möbius syndrome, eyes open. Image courtesy of M.J. Biavati. The causes of developmental facial paralysis are numerous and may be associated with syndromes and teratogens. Several subcategories exist that fall under the spectrum of oculo-auriculo-vertebral disorders that consists of anomalies of the first and second branchial arches. This is a common craniofacial disorder characterized by a wide spectrum of anomalies, including a conductive hearing loss due to external and middle ear deformities. The prevalence of sensorineural hearing loss (SNHL), as well as facial nerve dysfunction, is underappreciated. A retrospective study by Carvalho et al found that in a cohort of pediatric patients, hearing loss was present in 74 of 99 children (75%), with a conductive component in 73 patients. Sensorineural hearing loss was present in 11 patients (11%), with mixed hearing loss in most patients. Nearly a quarter of the patients (22 of 99 [22%]) had facial nerve dysfunction, but only 1 patient had facial palsy on the same side as the SNHL. Lower facial weakness occurs in 10-20% of cases and is likely related to bony involvement in the region of the facial canal. A nonhereditary variant of hemifacial microsomia is Goldenhar syndrome, which has vertebral anomalies and epibulbar dermoids. Osteopetrosis, a rare cause of paralysis at birth, may also manifest later in childhood. Newborn children with facial paralysis may present with noted asymmetric facial movement, incomplete eye closing, and difficulties feeding. They may have other more significant symptoms from other congenital defects. Determine the etiology of congenital facial nerve paralysis based on birth history, family history, physical examination, radiologic studies, and neurophysiologic tests. A family history positive for facial paralysis or other congenital anomalies increases the suspicion for a developmental cause of the facial paralysis. Examine the infant bilaterally and evaluate both the upper and lower portions of the face. Looking at forehead wrinkling, eye closure, and lip movement. A bilateral facial palsy is frequently incomplete, affecting either the lower or upper portion of the face. This helps to distinguish developmental causes of congenital facial paralysis from traumatic causes that often involves the upper and lower face equally and are often unilateral. The examination needs to evaluate the other cranial nerves and rule out other congenital anomalies. Often, a mild paresis of the facial nerve is not noticed at birth, especially if the injury is bilateral. When facial nerve paralysis is associated with hemifacial microsomia or other craniofacial abnormalities, the facial nerve is often not noted to be weak until the child grows and a more pronounced asymmetry develops, prompting closer evaluation of the facial nerve. To grade the severity of the facial paralysis, many grading systems exist, such as the Terzis-Noah scale. The most commonly used scale is the House-Brackmann listed below. The higher the grade, the least likely full recovery will occur. Traumatic congenital facial nerve paralysis usually resolves spontaneously and does not require surgery. A general guideline when considering surgery in a traumatic facial paralysis patient is to determine if clinical and electrophysiologic tests reveal (1) complete unilateral paralysis (H-B grade VI), (2) evidence of temporal bone trauma based upon CT scanning and physical examination, (3) complete loss of function of the facial nerve at age 3-5 days, and (4) absence of improvement by age 5 weeks. Surgery in patients with developmental facial paralysis is usually delayed until later in life. The facial nerve (cranial nerve VII) develops early in fetal life from the facioacoustic crest in the second branchial arch. All facial muscles are identifiable in the embryo by the 14th week. The facial nerve develops close to the vestibulocochlear nerve (cranial nerve VIII). Therefore, any abnormality of these structures often accompanies facial nerve deficits. At term, the anatomy of the facial nerve approximates the adult anatomy with the exception of its superficial location within a poorly pneumatized mastoid. Development of the mastoid bone occurs from age 1-3 years and displaces the facial nerve medially and inferiorly. The facial nerve is a complex mixed nerve containing motor, parasympathetic, special sensory (taste), and sensory components. The motor nucleus lies deep within the reticular formation of the pons, where it receives input from the precentral gyrus of the motor cortex. The motor fibers innervate the muscles of facial expression, posterior belly of the digastric muscle, stylohyoid muscle, and stapedius muscle. The upper motor neuron (supranuclear) tracts supplying the upper face cross once and then cross again in the pons; thus, bilateral innervation is present, whereas tracts to the lower face cross only once. The parasympathetic fibers originate in the superior salivatory nucleus and are responsible for lacrimation and salivation via the greater superficial petrosal nerve and the chorda tympani, respectively. Afferent taste fibers are carried from the anterior two thirds of the tongue to the nucleus tractus solitarius via the lingual nerve, chorda tympani, and nervus intermedius. The facial nerve also provides some sensory innervation to the external auditory canal. The intracranial segment of the facial nerve travels 23-24 mm from the brain stem at the level of the caudal pons to the internal auditory canal (IAC). The meatal segment includes 7-8 mm of the nerve between the fundus of the IAC and the meatal foramen. The facial nerve occupies the anterior-superior quadrant within the IAC. The labyrinthine segment is 3-5 mm in length and travels superior to the cochlea and vestibule to the geniculate ganglion. The first branch of the facial nerve, the greater superficial petrosal nerve, is within this segment. The tympanic segment is 12-13 mm in length and begins at the geniculate ganglion, where the nerve turns 40-80° posteriorly (first genu) to enter the middle ear on the medial wall of the tympanic cavity superior to the oval window and inferior to the lateral semicircular canal and ends at the pyramidal eminence. The nerve turns inferiorly (second genu) below the horizontal semicircular canal and continues as the mastoid (vertical) portion 15-20 mm and exits the stylomastoid foramen. The extratemporal portion of the facial nerve is distal to the stylomastoid foramen and supplies the muscles of facial expression. The facial nerve divides the parotid gland into superficial and deep lobes. Within the gland, branching of the nerve is variable. Most commonly, the nerve divides into an upper temporozygomatic and lower cervicofacial division. Five terminal branches innervate the mimetic musculature of the face, namely the temporal, zygomatic, buccal, marginal mandibular, and cervical branches. Ciorba A, Corazzi V, Conz V, Bianchini C, Aimoni C. Facial nerve paralysis in children. World J Clin Cases. 2015 Dec 16. 3 (12):973-9. [Medline]. [Full Text]. Evans AK, Licameli G, Brietzke S, Whittemore K, Kenna M. Pediatric facial nerve paralysis: patients, management and outcomes. Int J Pediatr Otorhinolaryngol. 2005 Nov. 69(11):1521-8. [Medline]. Falco NA, Eriksson E. Facial nerve palsy in the newborn: incidence and outcome. Plast Reconstr Surg. 1990 Jan. 85(1):1-4. [Medline]. May M, Schaitkin BM, Shapiro A. Facial nerve disorders in newborns and children. May M, Schaitkin BM. The Facial Nerve. 2nd. New York, NY: Thieme; 2000. 339-65. Hughes CA, Harley EH, Milmoe G, Bala R, Martorella A. Birth trauma in the head and neck. Arch Otolaryngol Head Neck Surg. 1999 Feb. 125(2):193-9. [Medline]. Mchugh HE. Facial Paralysis in birth injury and skull fractures. Arch Otolaryngol. 1963 Oct. 78:443-55. [Medline]. Sapin SO, Miller AA, Bass HN. Neonatal asymmetric crying facies: a new look at an old problem. Clin Pediatr (Phila). 2005 Mar. 44(2):109-19. [Medline]. Guien C, Blandin G, Lahaut P, et al. The French National Registry of patients with Facioscapulohumeral muscular dystrophy. Orphanet J Rare Dis. 2018 Dec 4. 13 (1):218. [Medline]. [Full Text]. Tomás-Roca L, Pérez-Aytés A, Puelles L, Marín F. In silico identification of new candidate genes for hereditary congenital facial paresis. Int J Dev Neurosci. 2011 Jun. 29(4):451-60. [Medline]. Shapiro NL, Cunningham MJ, Parikh SR, Eavey RD, Cheney ML. Congenital unilateral facial paralysis. Pediatrics. 1996 Feb. 97(2):261-4. [Medline]. Verzijl HT, van der Zwaag B, Cruysberg JR, Padberg GW. Möbius syndrome redefined: a syndrome of rhombencephalic maldevelopment. Neurology. 2003 Aug 12. 61(3):327-33. [Medline]. Bogart KR, Tickle-Degnen L, Joffe MS. Social Interaction Experiences of Adults with Moebius Syndrome: a Focus Group. J Health Psychol. 2012 Jan 18. [Medline]. Picciolini O, Porro M, Cattaneo E, et al. Moebius syndrome: clinical features, diagnosis, management and early intervention. Ital J Pediatr. 2016 Jun 3. 42 (1):56. [Medline]. [Full Text]. Blanchard K, Winikoff B, Ellertson C. Use of misoprostol during pregnancy and Möbius' syndrome in infants. N Engl J Med. 1998 Nov 19. 339(21):1553-4. [Medline]. Kankirawatana P, Tennison MB, D'Cruz O, Greenwood RS. Möbius syndrome in infant exposed to cocaine in utero. Pediatr Neurol. 1993 Jan-Feb. 9(1):71-2. [Medline]. Smets K, Zecic A, Willems J. Ergotamine as a possible cause of Möbius sequence: additional clinical observation. J Child Neurol. 2004 May. 19(5):398. [Medline]. Cattaneo L, Chierici E, Bianchi B, Sesenna E, Pavesi G. The localization of facial motor impairment in sporadic Möbius syndrome. Neurology. 2006 Jun 27. 66(12):1907-12. [Medline]. Carvalho GJ, Song CS, Vargervik K, Lalwani AK. Auditory and facial nerve dysfunction in patients with hemifacial microsomia. Arch Otolaryngol Head Neck Surg. 1999 Feb. 125(2):209-12. [Medline]. Cline JM, Hicks KE, Patel KG. Characterization of facial paresis in hemifacial microsomia. Otolaryngol Head Neck Surg. 2014 Feb. 150(2):188-93. [Medline]. Li Q, Zhou X, Wang Y, Qian J, Zhang Q. Facial Paralysis in Patients With Hemifacial Microsomia: Frequency, Distribution, and Association With Other OMENS Abnormalities. J Craniofac Surg. 2018 May 15. [Medline]. Puñal JE, Siebert MF, Angueira FB, Lorenzo AV, Castro-Gago M. Three new patients with congenital unilateral facial nerve palsy due to chromosome 22q11 deletion. J Child Neurol. 2001 Jun. 16(6):450-2. [Medline]. Joyce P, O'Rourke C, McDermott B, Heussler H. Health-related quality of life in 22q11.2 deletion syndrome: The child's perspective. J Paediatr Child Health. 2018 Mar. 54 (3):311-5. [Medline]. Aramaki M, Udaka T, Kosaki R, et al. Phenotypic spectrum of CHARGE syndrome with CHD7 mutations. J Pediatr. 2006 Mar. 148(3):410-4. [Medline]. Blake KD, Hudson AS. Gastrointestinal and feeding difficulties in CHARGE syndrome: A review from head-to-toe. Am J Med Genet C Semin Med Genet. 2017 Dec. 175 (4):496-506. [Medline]. [Full Text]. Statland J, Tawil R. Facioscapulohumeral muscular dystrophy. Neurol Clin. 2014 Aug. 32 (3):721-8, ix. [Medline]. [Full Text]. Meyerson MD, Lewis E, Ill K. Facioscapulohumeral muscular dystrophy and accompanying hearing loss. Arch Otolaryngol. 1984 Apr. 110(4):261-6. [Medline]. Goselink RJM, Mul K, van Kernebeek CR, et al. Early onset as a marker for disease severity in FSHD. Neurology. 2018 Dec 19. [Medline]. Roedel R, Christen HJ, Laskawi R. Aplasia of the depressor anguli oris muscle: a rare cause of congenital lower lip palsy?. Neuropediatrics. 1998 Aug. 29(4):215-9. [Medline]. Udagawa A, Arikawa K, Shimizu S, et al. A simple reconstruction for congenital unilateral lower lip palsy. Plast Reconstr Surg. 2007 Jul. 120(1):238-44. [Medline]. Pastuszak AL, Schuler L, Speck-Martins CE, et al. Use of misoprostol during pregnancy and Möbius' syndrome in infants. N Engl J Med. 1998 Jun 25. 338(26):1881-5. [Medline]. Bergman I, May M, Wessel HB, Stool SE. Management of facial palsy caused by birth trauma. Laryngoscope. 1986 Apr. 96(4):381-4. [Medline]. Carpenter, MB. Carpenter's Human Neuroanatomy. 9th. Williams and Wilkins; 1996. Jyonouchi S, McDonald-McGinn DM, Bale S, Zackai EH, Sullivan KE. CHARGE (coloboma, heart defect, atresia choanae, retarded growth and development, genital hypoplasia, ear anomalies/deafness) syndrome and chromosome 22q11.2 deletion syndrome: a comparison of immunologic and nonimmunologic phenotypic features. Pediatrics. 2009 May. 123(5):e871-7. [Medline]. Jemec B, Grobbelaar AO, Harrison DH. The abnormal nucleus as a cause of congenital facial palsy. Arch Dis Child. 2000 Sep. 83(3):256-8. [Medline]. Ondik MP, Preston T, Towfighi J, Isaacson JE. Unilateral congenital facial nerve paralysis secondary to a benign epithelioid peripheral nerve sheath tumor. Otol Neurotol. 2007 Dec. 28(8):1091-3. [Medline]. Lin KM, Huang CC, Leung JH. Congenital unilateral facial palsy and internal auditory canal stenosis. Pediatr Neurol. 2008 Aug. 39(2):116-9. [Medline]. Sasaki M, Imamura Y, Sato N. Magnetic resonance imaging in congenital facial palsy. Brain Dev. 2008 Mar. 30(3):206-10. [Medline]. Patil-Chhablani P, Murthy S, Swaminathan M. Ophthalmic profile and systemic features of pediatric facial nerve palsy. Eye Sci. 2015 Dec. 30 (4):147-50. [Medline]. Volk GF, Pantel M, Guntinas-Lichius O. Modern concepts in facial nerve reconstruction. Head Face Med. 2010 Nov 1. 6:25. [Medline]. [Full Text]. Humphrey CD, Kriet JD. Nerve repair and cable grafting for facial paralysis. Facial Plast Surg. 2008 May. 24(2):170-6. [Medline]. Mehta RP. Surgical treatment of facial paralysis. Clin Exp Otorhinolaryngol. 2009 Mar. 2(1):1-5. [Medline]. [Full Text]. Ysunza A, Inigo F, Rojo P, Drucker-Colin R, Monasterio FO. Congenital facial palsy and crossed facial nerve grafts: age and outcome. Int J Pediatr Otorhinolaryngol. 1996 Jul. 36(2):125-36. [Medline]. Terzis JK, Olivares FS. Mini-temporalis transfer as an adjunct procedure for smile restoration. Plast Reconstr Surg. 2009 Feb. 123(2):533-42. [Medline]. Fatemi MJ, Forootan SK, Habibi M, Pooli AH, Mansoori MJ. Toward shortening interoperation period in two-stage cross facial nerve graft with muscle transfer. Ann Plast Surg. 2008 Jun. 60(6):639-43. [Medline]. Terzis JK, Olivares FS. Long-term outcomes of free muscle transfer for smile restoration in children. Plast Reconstr Surg. 2009 Feb. 123(2):543-55. [Medline]. Biglioli F, Frigerio A, Rabbiosi D, Brusati R. Single-stage facial reanimation in the surgical treatment of unilateral established facial paralysis. Plast Reconstr Surg. 2009 Jul. 124(1):124-33. [Medline]. Veyssiere A, Labbe D, Benateau H. Lengthening temporalis myoplasty and facial paralysis from birth. J Plast Reconstr Aesthet Surg. 2015 Mar. 68 (3):312-20. [Medline]. Rose EH. Autogenous fascia lata grafts: clinical applications in reanimation of the totally or partially paralyzed face. Plast Reconstr Surg. 2005 Jul. 116(1):20-32; discussion 33-5. [Medline]. Liu YM, Sherris DA. Static procedures for the management of the midface and lower face. Facial Plast Surg. 2008 May. 24(2):211-5. [Medline]. Silver AL, Lindsay RW, Cheney ML, Hadlock TA. Thin-profile platinum eyelid weighting: a superior option in the paralyzed eye. Plast Reconstr Surg. 2009 Jun. 123(6):1697-703. [Medline]. Domantovsky I, Copeland J, Clancy RM, Zuker RM, Borschel GH. Long-Term Outcomes of Smile Reconstruction in Möbius Syndrome. Plast Reconstr Surg. 2018 Jun. 141 (6):868e-82e. [Medline]. Hadlock T. Facial paralysis: research and future directions. Facial Plast Surg. 2008 May. 24(2):260-7. [Medline]. 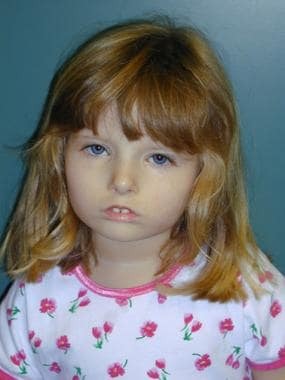 Child with Möbius syndrome, eyes closed. Image courtesy of M.J. Biavati. Child with congenital heart disease and left lower lip palsy suggestive of velocardiofacial syndrome. Image courtesy of M.J. Biavati. Incision marking for a XII-VII crossover with jump graft. Image courtesy of A.D. Bruns. Surgical exposure of the facial nerve, hypoglossal nerve, and great auricular nerve. Image courtesy of A.D. Bruns. Surgical photo of a XII-VII crossover with jump graft. The great auricular nerve graft is sutured to the proximal portion of the facial nerve and to a partial sectioned hypoglossal nerve (preserving approximately two thirds of the axons going to the tongue). Image courtesy of A.D. Bruns. The authors and editors of Medscape Drugs & Diseases gratefully acknowledge the contributions of previous author Kim Lundstrom, MD, to the development and writing of this article.